The researchers find that firms resistant to adopting software-based techniques are being outperformed by their peers. As a result, the researchers observe an “R&D (research and development) productivity gap” in the traditional manufacturing sector where highly software-intensive firms produce more patents for each dollar invested in R&D than less software-intensive firms. They also find evidence that equity markets tend to value software-intensive firms more than others. Merely increasing enrolment will not lead to the development of elementary skills that education is supposed to provide. The Annual Status of Education Report (ASER) 2017 ‘Beyond Basics’ was recently released and is unfortunately on expected lines. The report highlights the sorry state of education when it comes to India’s 14-18-year-olds and asks rather uncomfortable questions that policy practitioners must find answers to. In an earlier article, we had outlined some issues that have plagued India’s primary education sector and some anticipations that we had from the ASER 2017 report. Not surprisingly, we see a repetition of the same issues when it comes to India’s secondary education space. Previous ASER reports observed that despite high enrolment ratios of over 96% in the last eight years in the primary education sector, improvement in reading outcomes and arithmetic ability continues to be low. Moreover, a large proportion of students in both government and private schools continue to be below the ‘Grade level’. Grade level means that a student can deal with what is expected of her in that grade. The ASER 2017 is targeted to look ‘beyond basics’: the age group between 14-18, primarily those outside the Right to Education ambit and on the verge of entering adulthood. The government’s flagship Rashtriya Madhyamik Shiksha Abhiyan (RMSA) launched in 2009 and re-booted in 2013 as RMSA-Integrated has not been much of a success in India’s secondary education scene. What we find as a salient feature of this report is the coverage on the aspirations of young India. Capturing ‘aspirations’ by well-defined metrics is a tough ask, very few datasets across the world capture them with some rigour. The Young Lives Survey in Peru is one example that comes to our mind that captures subjective well-being and is actively used by researchers to gauge aspiration-achievement shortfall and their reasons. While successive governments pride over India’s sizable ‘demographic dividend’, the ASER 2017 points starkly to the basic skill gaps that plague our young population. Before documenting some necessary takeaways from the ASER 2017 report, it is prudent to mention that the complexity of the data collected makes the national estimates a summation of estimates generated at the district level (24 states, 26 districts, 23,868 households and 28,323 youths). Like the primary education sector, enrolment rates have also been high and increasing in the secondary education space. The RTE Act covers mandatory and free schooling up until the age of 14, or roughly grade 8. ASER surveys show that enrolment in grade 8 has been steadily increasing from less than 50% in 2005-06 to close to 90% in 2014-15. However, the quality of education remains a concern. ASER’s statistics have shown how the ability of grade 8 students has been consistently falling over the years, coinciding with the increase in enrolment rates. Another important issue is analysing how enrolment rates develop after grade 8, or once students are no longer under the purview of the RTE Act. Looking at the 2011-12 grade 8 cohort, the findings show about a one-third decline until grade 12, indicative of a trend of increasing dropout rates after grade 8. The same trend is reflected when enrolment rates are analysed by age, showing a steady increase from age 14-18. The reasons for discontinuing studies vary. Around 25% of the youth who dropped out after grade 8 said they did so due to financial reasons. Worryingly, a large number of students (34% of boys and 19% of girls) said they dropped out due to lack of interest, pointing to deficiencies in the curriculum and teaching infrastructure. One-third of girl students said they dropped out due to ‘family constraints’. Also read: Enrolment Rates Are Climbing. So What Explains the Sorry State of India’s Education Sector? Another startling fact is that about 17% of students dropped out because they failed in their studies. Current government policy doesn’t allow schools to fail students until grade 8. As the ASER report points out, while the intention of the policy is commendable, there need to be measures in place to identify and focus on students who have fallen behind in the earlier grades. Currently, it would seem that the policy of not failing students has led to an adverse consequence where students left behind are not identified until they end up failing exams after grade 8. Despite the fall in enrolment rates, over 86% of youth in the 14-18 range continue to be within the formal education system. Only about 5% are taking some type of vocational training, the majority of which are less than three months long. Interestingly, a substantial proportion of youth in this age group is employed, irrespective of whether they are engaged in formal education or not. Overall, 42% of the youth is employed, including 39% of students engaged in formal education and 60% of students who have dropped out. Most of the work – over 70% – is on their own family’s farm. It is instructive to keep in mind here that ASER is a rural survey and urban deficiencies are still a black box when it comes to concrete data. However, after accounting for work and enrolment in vocational courses, over one-third of the youth who have dropped out of education are not engaged in any kind of activity, i.e. neither studying, preparing for exams or employed – with nearly 75% of them being girls. As shown in Figure 1, youth in the 14-18 age bracket didn’t have the skills expected of them from an elementary education and worryingly, there has been a declining trend in these skills. Apart from basic reading and arithmetic, ASER also conducted some testing on common everyday skills like counting money, reading maps, measuring length, calculating time, etc. The performance of the youth in these tasks was noticeably better. The surveys use some specific metrics like access to mobile phones and bank accounts as proxies of youths’ exposure to the outside world. The findings are mixed: Approximately three-fourths of the youth surveyed had access to mobile phones and had their own bank account. But only about one-fourth had access to the internet and a computer, and only 16% had ever used an ATM. In terms of aspirations, over 60% of youth in the age of 14-18 had aspirations to study beyond grade 12. Professional aspirations varied from military service and police for boys, to nursing and teaching for girls. After acknowledging the importance of early childhood education as well secondary education after age 14, the government is considering increasing the coverage of the RTE Act from 6-14 years to 3-16 years. However, as the current and previous ASER reports have demonstrated, merely increasing enrolment will not lead to the development of elementary skills that education is supposed to provide. If anything, the increase in enrolment rates over the last decade has coincided with the fall in the ability of students. Thus, stakeholders must take additional steps to ensure that the quality of education being imparted is not affected. In that regard, two interesting policy interventions that are in the process of being rolled out hold some promise: same language subtitling (SLS) and outcomes fund for the education sector. Drop-out cases involving ‘loss of interest’ and ‘inadequate funds’ are problems that can be innovatively tackled. It is high time India develops its own indigenous Escuela Nueva model for the primary and secondary education space incorporating experiences from various cross-country models. Similarly, a large outcome-based fund for education is all set to launch in India in early 2018. Touted as one of the first and largest funds for social enterprises, the fund would invest in education providers to work with government-run schools to deliver outcomes. There could be a variety of outcomes like early childhood interventions, retention of girl students, learning in primary schools and employability of students after high school. The fund is being launched by the Global Social Impact Investment Steering Group, an organisation comprising 13 member countries (including India), with a focus on channelling global social impact investment. Outcome fund based models are actively being employed by nations across the globe to fund social projects and have the potential to deliver the necessary outcomes. While the statistics borne out by ASER 2017 do reveal a gamut of concerns regarding our secondary education sector, let’s take this as an opportunity to set up our house in order. While we may be gung-ho about increasing GDP growth rates or surpassing major economies by 2030, let’s also focus on translating these high numbers to meet the aspirations of India’s young and providing them with an education system that is innovative, proactive and prescient and yet deeply invests in foundational skills. The ‘dividend’ that we enjoy must not end up becoming a recipe for ‘disaster’. Economic research shows that interventions aimed at improving cognitive skills rather than mere enrolment rates are required to boost economic growth. Let’s take a step back and illustrate how our performance has been in the age group 3-16. Here is a snapshot of ASER’s previous reports on the state of India’s early grade development. The percentage of children in grade 3 who are able to read at least a grade 1 level text has improved marginally – from 40% in 2014 to 42.5% in 2016. Percentage of grade 3 children who could do two digit subtraction has marginally improved from 25% in 2014 to 27% in 2016. This has been the first year since 2010 when there has been an upward trend observed in arithmetic ability. He proposed several possible explanations for this phenomenon, the most important of which being the classic quantity-quality argument: Quality of educational attainment was so low that despite high educational attainment there wasn’t a significant increase in cognitive skills and human capital. As outlined above, the very idea that improved schooling (through the lens of school attainment rates) – which has often been a cornerstone of most interventionist strategies – will raise economic well-being has often been discounted by economists. Eric Hanushek and Ludger Woessmann in their authoritative paper, ‘The Role of Cognitive Skills in Economic Development (2008)‘ find strong evidence that the cognitive skills of the population – rather than school attainment rates – are powerful determinants of earnings, economic growth and income distribution. Their work premises itself on a rather simple question: whether education is the steering force or merely one of the several factors that are correlated with more fundamental development forces, say cognitive skills when it comes to economic growth. Hanushek-Woessmann armed with strong econometric evidence argue that cognitive skills overwhelmingly outnumbers schooling attainment rates when it comes to influencing economic growth. Moreover, the effect of cognitive skills on economic growth is larger in developing countries than in the developed ones. In addition to the findings mentioned above, the heterogeneous effects of cognitive skills vis-a-vis the income levels of the economies is rather stark: the magnitude of the effect of cognitive skills is about 60% higher for low-income countries compared to high-income countries, and this more than doubles when low total-factor productivity (TFP) countries are compared to high TFP countries. From a policy perspective, this encourages the view that the promotion of education policies that focus on the quality of education has especially larger payoffs in the least developed regions through the productivity channel. To sum it up, economic research overwhelmingly supports the idea of interventions aimed at improving cognitive skills rather than mere enrolment rates. Escuela Nueva accepts multigrade teaching as an unavoidable condition in small schools of rural areas. It encourages to develop special materials and teaching methods for multigrade teaching. The academic achievement of the students in Escuela Nueva has been consistently higher than in urban schools. There are plenty of cross-country experiences to learn from and we should actively explore and replicate them here. India made its debut in the Programme for International Student Aptitude (PISA) test in 2009 with 16,000 students from 400 schools across Himachal Pradesh and Tamil Nadu. While China – also a first-timer in 2009 – stormed into the number one position with Shanghai schools topping in math and science, India was at a paltry 72nd among the 74 participating countries. Since then, India has boycotted the PISA rankings citing ‘methodological differences’ but it plans to return to the rankings fold in 2021. Coupled with ASER’s findings over the years, this paints a sorry state of India’s primary education sector. Additionally, in India, there are two interesting policy interventions that are in the process of being rolled out: same language subtitling (SLS) and outcomes fund for the education sector. Similarly, a large outcome-based fund for education is all set to launch in India in early 2018. Touted as one of the first and largest funds for social enterprises, the fund would invest in education providers to work with government-run schools to deliver outcomes. There could be a variety of outcomes like early childhood interventions, retention of girl students, learning in primary schools and employability of students after high school. The fund is being launched by the Global Social Impact Investment Steering Group, an organisation comprising 13 member countries (including India), with a focus on channeling global social impact investment. Outcome fund based models are actively being employed by nations across the globe to fund social projects and has the potential to deliver the necessary outcomes. While we wait for ASER’s 2017 findings, much of the theory and evidence that we have strongly suggests that raising enrolment rates hasn’t been enough to push our growth frontiers. The hope is that the required stakeholders will aim, plan and push for innovative interventions that encourage student achievements. Indian imports rose by 23.40% year-on-year (y-o-y) for the first eight months of the calendar year 2017, after contracting by 6.80% between April-December 2016. 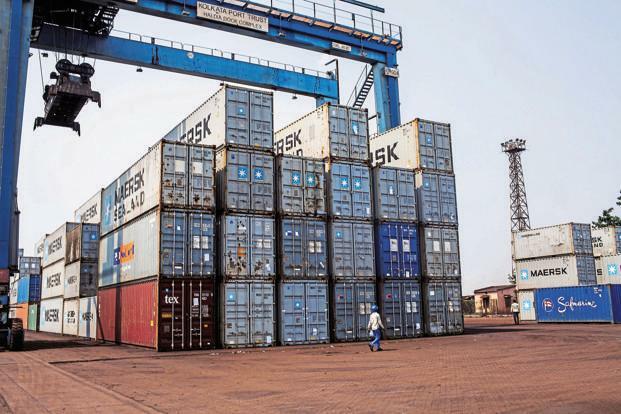 Many economists believe that the sharp reversal in imports could be attributed to broken domestic supply chains, as a consequence of the demonetisation exercise that was conducted in November 2016. Experts also point to low industrial production numbers, which they claim suggest that rising imports are substituting domestic production rather than satisfying increased domestic demand. Is this causal inference correct? We believe that it is not, and we present compelling evidence in this article to support our view. Even before getting into what leads to an imports surge, it is instructive to analyse the nature of India’s import bill and the drivers of imports growth. For January-August 2017, the three sectors, namely, mineral products, stone and glass, and electrical/machinery (out of 15 according to the Harmonized Classification System), accounted for 64.83% of the import bill. Some of the important commodities within these sectors include petroleum, liquefied natural gas, diamonds, gold and mechanical equipment. But even more importantly, these three sectors explain 81.30% of the rise in imports during January-August 2017 (see chart). Mineral products account for 27% of the growth in imports while the stone and glass sector (which includes jewellery) accounts for a whopping 42%. Hence, the aggregate import number is heavily skewed because of these sectors and masks the trade performance of most other sectors. If one goes beyond these top sectors, imports growth is much more muted. While the total imports bill for the top three sectors grew by 34% y-o-y, it only grew by 7% y-o-y for the other sectors. Hence a 23% surge in imports bill during January-August 2017 is not the result of rising imports across the commodity spectrum. The second aspect of the imports bill is that it is a nominal imports bill, not the real bill. Nominal imports equal the quantity imported times the import price. Using data from the directorate general of commercial intelligence and statistics, we decompose the total rise in value into price effect and the quantity effect. The entire rise in import value (around 98%) for mineral products and a substantial part of metal imports is due to the firming of prices of petroleum, oil and gas and basic metals. For the other two sectors, namely stone/glass and electrical machinery, the rise in value mainly reflects the rise in quantity imported as the prices of these commodities have not gone up in recent times. For other sectors like wood, rubber, plastics and footwear, it’s a mix of quantity and price effect. Hence it is not entirely a quantity effect that we would have seen had the supply chains been truly broken. To dig further into the hypothesis of broken supply chains and weak production, we employ two simple tests. The first is that if the domestic supply chains are broken, then it should in general affect export performance too. We find that sectors with larger growth in imports during January-August 2017 also experienced strong growth in exports during the same period. Exports in the three largest sectors (by their share in the import bill) grew by 10% y-o-y overall, in line with aggregate exports growth of 11.2%. 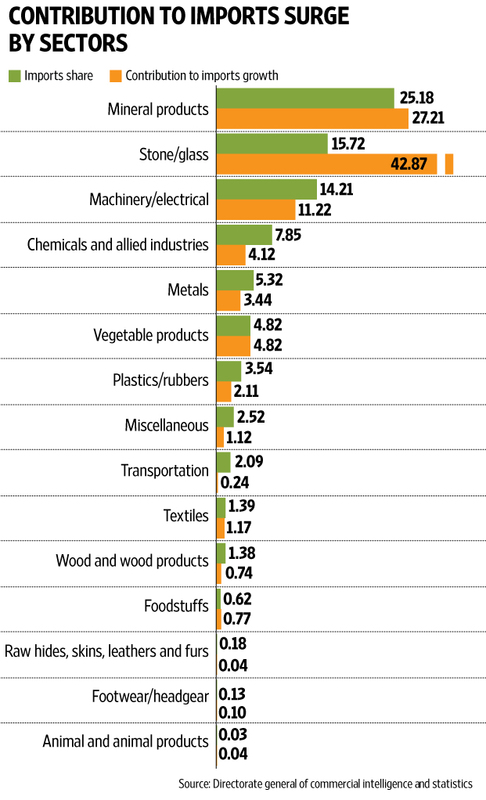 Growth in exports was 12.14% for the other sectors. For other sectors also, there is a good positive correlation between imports growth and exports growth. Out of the top 25 commodities by growth in import value, only four registered poor export performance (the bottom 25%) while 18 commodities registered above-average export performance. The second test exploits the fact that demonetisation hit the informal sectors hardest. Hence, if imports are substituting weak domestic production, we should see a large growth in imports for the commodities produced in the informal sector, especially in terms of their quantities. The mineral products and electrical machinery sectors are not very informal in their operations and supply chains. These two sectors have 26 companies in the NSE 100 Index as on the date of writing, indicating that it’s a formal sector, yet these experienced large import growth. On the other hand, consider metals. The metal sector experienced imports growth of 19.9% while exports grew by 50%. Some of the commodities within metals, like iron and steel, saw experts grow by over 100%, while imports only grew by a mere 3%. A significant amount of the production process of iron and steel and other metals happens within the informal sector where workers are typically paid cash wages. Hence some of the important commodities produced within the informal sectors did not experience a surge in imports but, in fact, showed good export performance. The same holds true for ash, ores and slag, where growth is 130%, and for vegetable oils which are, in fact, produced within an even more informal industry than iron and steel. The conclusion holds even after extending the analysis beyond larger sectors; imports growth is not concentrated in informal sectors. 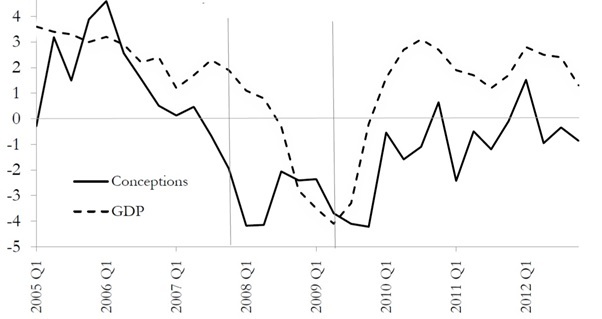 Overall, we did not observe the evidence that imports rose because of broken domestic supply chains. However, we don’t claim that the supply chains were unaffected due to demonetisation. What our analysis claims is that the import surge is sort of disconnected from the fact that demonetisation might have broken supply chains to some extent. Then what explains the rise? The exchange rate has appreciated from around ₹68 in January to ₹63.50 against the US dollar in August 2017. Around 85% of India’s imports are invoiced in dollars and hence, at least in the short run, the rupee/dollar rate is more significant a determinant of imports than bilateral exchange rates. Given the sharp appreciation till August, at least part of the rise in imports is surely explained by the exchange rate movement. Apoorva Javadekar and Sujan Bandyopadhyay are, respectively, research director and research associate at CAFRAL. “We should be very careful lest fiscal actions undercut macroeconomic stability,” said Reserve Bank of India (RBI) Governor, Urjit Patel, in response to a journalist’s query on fiscal stimulus packages during the monetary policy conference on October 2017. The Prime Minister’s Economic Advisory Council (PMEAC) has also recently expressed its reservations about a mid-term fiscal stimulus package by the government to revive India’s economic growth. While critics of a fiscal stimulus cite macroeconomic stability — most notably upside inflation risks — as a key reason against a fiscal stimulus, advocates routinely talk about the famed fiscal multiplier and how it would spur a much-needed economic revival. Fiscal multipliers were first introduced to the world by John Maynard Keynes during the Great Depression of the 20th century. Keynes had argued that a recession could be curtailed by an increase in government expenditure, fuelling savings and capital formation. For instance, a rise in the government expenditure of $100 would raise the real GDP or gross domestic product of a country by more than $100 and bring it back on the path of economic growth. Keynes and his policies began to be followed by policymakers all over the world until the advent of Milton Friedman, one of the most influential economic thinkers of the 20th century. Friedman challenged ‘naive Keynesianism’ (as he put it) and argued that a fiscal expansion is highly inflationary even as the neoclassical school argued that fiscal deficits brought about by an expansionary fiscal policy would result in rising interest rates, and a subsequent crowding out of private investment. These ‘non-Keynesian’ effects of government spending were fist empirically documented in the 1990s in a series of researches published by the National Bureau of Economic Research (NBER), a leading economic research organisation in the US. The authors – Francesco Giavazzi of the NBER and Marco Pagano of the University of Naples Frederico II – studiedthe impact of fiscal contractions and expansions in Organisation for Economic Cooperation and Development (OECD) countries, and analysed their impact of private investment, consumption, and economic growth. The OECD is an intergovernmental economic organisation with 35 member countries, most of whom are high income and can be considered as being developed. Interestingly, they found that spending cuts in Denmark (1983-86) and Ireland (1987-89) actually lead to an increase in aggregate demand and private consumption, stimulating economic growth. On the other hand, the Swedish fiscal expansion — where Swedish Government Debt to GDP jumped from 25 per cent in 1990 to 67.8 per cent by 1994 — counterproductively led to a fall in private consumption and investment. The authors called the events in Denmark and Ireland as ‘expansionary fiscal contractions’, while the events in Sweden as ‘contractionary budget expansions’. Simply put, the impact of the fiscal multiplier in these cases was negative. These events were not anomalies as further studies have gone on to show several such outcomes from budgetary changes. In India, there have always been divergent views about the effectiveness of a fiscal stimulus. An important Keynesian argument to illustrate the effectiveness of the multiplier is that a fiscal stimulus should increase income and eventually spur private savings and investment. Does this hold good for Indian? A look at the chart below suggests otherwise. India’s fiscal deficit as percentage of GDP declined continuously from 5.98 per cent in 2001-02 to 2.54 per cent in 2007-08. But, contradictory to the Keynesian view, domestic savings as a percentage of GDP show a continuous rise, peaking at around 38 per cent in 2007-08 when the deficit was the lowest. Subsequently, there was a sharp decline in savings in 2008-09 due to the onset of the financial crisis in a situation economists commonly refer to as ‘savings paradox’ — where individuals desire to save more due to increasing uncertainty in the economy, but end up saving less due to a decline in their incomes as brought about by a crisis. Focusing on years after the crisis, fiscal deficit rose continuously from 2010-11 until 2014-15, but savings have been on a downward trajectory, clearly suggesting an absence of a Keynes style deficit–income-savings correlation in India. In the Study of State Finances report of 2016-17, the RBI expressed concerns about how increased market borrowings by the states could lead to higher bond yields and costs associated with borrowing. Even a significant part of the central government’s borrowing requirement is taken care of by market borrowings – based on budget estimates net market borrowings for the year 2017-18 stand at Rs 3.48 trillion, or about 64% of the gross fiscal deficit. Since an increased fiscal deficit is likely to be financed with market borrowings, it is likely that bond yields would rise. Theoretically, this can crowd out private investment and have a detrimental effect on the economy, especially at a time when banks are not willing to lend fearing rise in bad debts and many companies have been raising money from the corporate bond market. There have been several studies, which corroborate the relationship between a fiscal stimulus and higher cost of borrowing, including a 2004 study published by Economic & Political Weekly, where an RBI Economist Rajan Goyal, established the relationship for India. Even those who advocate a fiscal stimulus acknowledge that fiscal multipliers only lead to economic growth when the increased government expenditure is spent productively. A study by the National Institute of Public Finance and Policy, a New Delhi-based economic policy think tank, in 2012 had found that a capital expenditure multiplier was 2.45, while other revenue expenditure multipliers were less than one. However, if one looks at India’s government capital expenditure, the trend is puzzling. In the years when the fiscal deficit was higher, there was a drop in the government’s capital expenditure. This clearly suggests that the quality of expenditure in a fiscal stimulus may not necessarily lead to an economic revival. A fiscal stimulus will also have a bearing on India’s sovereign rating. It has been stuck at a low level, being upgraded only once in the past 25 years. On 2nd November 2016, the credit rating agency S&P Global Ratings kept the credit rating for India unchanged at the lowest investment grade (BBB-), only 1 grade higher than a junk bond rating, with a stable outlook, citing India’s low per capita income and weak public finances as the major reasons. Moody’s and Fitch Ratings followed the suit, expressing scepticism regarding upgrading India’s rating in the near future. The issue of consistently low ratings baffles Indian economists. India’s chief economic advisor Arvind Subramanian blamed the agencies for their ‘poor standards’, while India’s Economic Affairs Secretary, Shaktikanta Das, had said that rating agencies were out of touch with India’s reality. Even the OECD threw its weight behind India, suggesting that India deserves a credit rating upgrade. Macroeconomic performance, growth prospects, debt position and the state of public finances are some of the key criteria used by rating agencies. With the growth rate sagging, India’s only hope of expecting a better rating in the future is for the government to be fiscally prudent. An untimely fiscal stimulus will lead the government missing the 3.2 per cent fiscal deficit target in fiscal year 2018, dent credibility of the government and ruin chances of upgradation in our sovereign rating. The investment climate continues to be weak – gross fixed capital formation as a percentage of GDP has steadily declined from 34.3 per cent in 2011-12 to 29.5 per cent in 2016-17. In such a scenario, missing the fiscal deficit target may dent the confidence of investors, which in turn, could end up threatening capital inflows. When a patient is sick, the doctor will always suggest medicines but some of the medicines have side effects and taking too much of them may end up causing more harm than good to the patient. It’s time India’s policymakers prescribed the right remedy for the ills that have been plaguing the economy. Fiscal stimulus is not the panacea. While examining previous trends and research on capital flows and total factor productivity, Aniruddha Ghosh and Sujan Bandyopadhyay write that India must be careful to continue to maintain the positive correlation between growth and net foreign capital flows. While the Kantian view on increasing economic integration was primarily driven by considerations of war and peace, international capital flows and their management have become pivotal to the macroeconomic growth and stability of modern economies. Over the course of the last two decades, India’s net capital flows have surged from little over the US $500 million in the first quarter of 1990-91 to the US $25.38 billion in the first quarter of 2017-18. 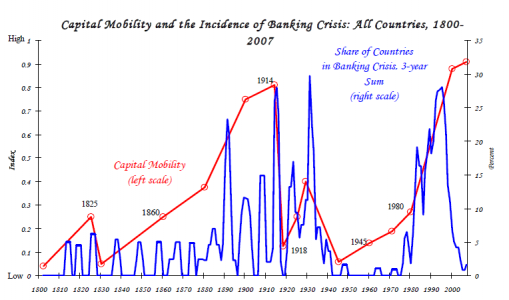 In This Time is Different (2011), Carmen Reinhart and Kenneth Rogoff flag an important historical insight: Periods of high international capital mobility have repeatedly produced international banking crises, not only famously as they did in the 1990s, but historically. The traditional neoclassical technology models tell us that net financial capital flows should move from richer to poorer countries. That is, it should flow from countries that are capital-abundant, and thus lower returns, to those that are capital-scarce (higher returns) and have greater investment opportunities. Robert Lucas Jr . has pointed out an empirical paradox using the 1988 data: If the traditional neoclassical model were true, the rate of return on a unit of capital investment in India would be nearly 58 times more than the return one would get in the US, yet the level of capital flows to India from the US were modest and nowhere near the levels the traditional theory predicted. Hence, the traditional neoclassical theory fails to imbibe the assumptions of cross-country differences in productivity and capital market imperfections. After accounting for cross-country differences in the fundamentals and capital market frictions, the risk-adjusted returns to investment should govern capital flows and therefore, should resolve the paradox. 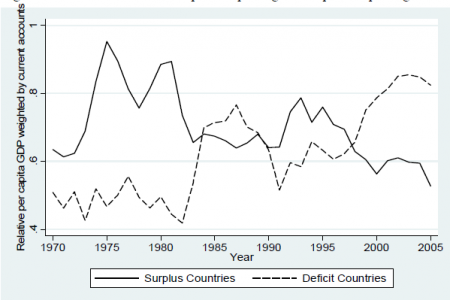 However, the paradox remains as relevant today given that the poorer countries of the world tend to run current-account surpluses (thus exporting capital) and the richer ones (most notably the US) tend to run current-account deficits (thus importing capital). The paradox gets rather perverse when we move from absolute levels of income to income growth. In 2006, “Foreign Capital and Economic Growth,” written by Eswar Prasad, Raghuram Rajan and Arvind Subramanian and published by the International Monetary Fund, took the question of capital flows one step forward. The paper presented evidence to support the intensification of the Lucas Paradox, while observing that within developing countries, growth and foreign capital inflows were, in fact, negatively correlated. This meant that poorer countries which had higher amounts of net foreign capital inflows had lower economic growth than those that didn’t. Additionally, within the group of poorer nations, capital flows out of countries that grow faster. Interestingly, this relationship breaks down for developed nations, i.e. developed nations have a positive correlation between growth and foreign flows. The authors of the IMF paper argue that there could be a number of reasons why we see this anomaly between growth rates of developing countries and their foreign capital flows. Firstly, successful developing countries may have a limited ability to absorb foreign capital flows due to structural impediments in their financial sector. Secondly, it is possible that developing nations actively make the choice to avoid excess foreign flows to prevent overvaluation of assets. And the final conclusion is that nations develop, structural impediments in their financial sectors reduce and their ability to absorb foreign flows increases – such that it can become a driver of growth, like industrialized nations, in the long run. 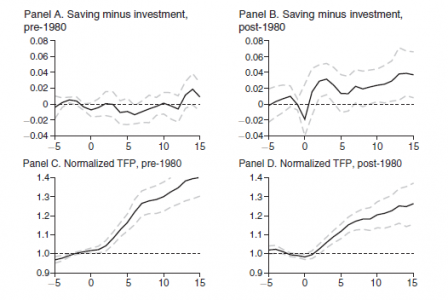 To explain these rather perverse findings presented in the IMF paper , Francisco J.Buera and Yongseok Shin in their 2017 paper, “Productivity Growth and Capital Flows: The Dynamics of Reforms”, focus on the relationship between growth accelerations in total factor productivity (TFP) and capital flows. They attribute the observational findings to the disparate dynamics of aggregate savings and investment behavior. For the readers, TFP accounts for the growth in output not accounted for by the growth in inputs used for its production and is often synonymous with improvements in the technological state of an economy. A rising TFP is necessary for a higher economic growth rate and therefore, investment in R&D is essential for sustained economic growth. 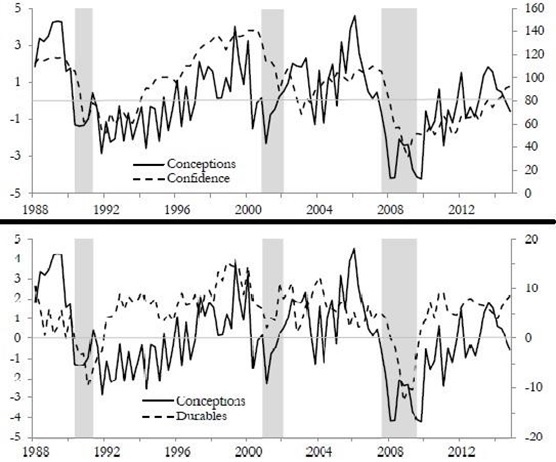 Buera and Shin present the following observations using data for 22 sustained growth acceleration episodes post-1980. First, in contradiction to the predictions of standard neoclassical models, capital flows out of countries experiencing fast growth in output and TFP. Second, this pattern is a lot more prominent in the early stages of these growth accelerations, where many of these nations undergo economic reforms. These first generation reforms are primarily concerned with the removal of idiosyncratic distortions (tax-cuts) in their economies. Finally, capital outflows reflect a surge in aggregate savings and a delayed rise in aggregate investment at the onset of sustained growth accelerations. Interestingly, when the reform is a far-reaching one – it removes goods market distortions as well as improves the health of financial institutions (second generation reforms) – capital flows into the countries experiencing faster TFP growth. India has had a long and chequered history with foreign capital flows. The first few decades after independence were characterised by import substitution policies which placed severe restrictions on the flow of foreign goods and capital, and it is only in the last few decades that foreign flows to India have really picked up. 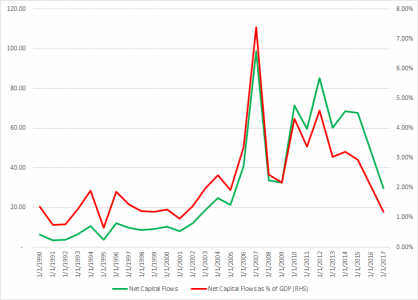 In the last two decades, both net foreign capital flows and GDP have grown substantially indicating a positive correlation, though this positive correlation is not as strong as the traditional neoclassical models predict. In light of the fact that there have been rising TFP levels in recent years as well, India must be careful to continue to maintain this positive correlation between growth and net foreign capital flows. Rakesh Mohan, in a speech in 2008 in his capacity as the Deputy Governor of the Reserve Bank of India said, “A large surge in capital [in]flows over a short span of time in excess of domestic absorptive capacity of the economy can lead to upward pressure on the exchange rate, possible overheating of the economy and asset price bubbles. They can also pose the risk of an abrupt reversal, which may have potential negative real economic effects.” With far-reaching reforms in the goods and capital markets, it becomes imperative for the NDA government to keep these historical and policy insights in mind. Advanced economies may be facing declining returns on research effort. This makes it all the more imperative that the Modi government gets its house, with regard to R&D, in order. Demonetisation, the goods and services tax (GST), a structural slowdown, or some other unknown factor – the jury is still out on what has caused the Q1 GDP numbers of 2017 to slide in India. While shocks do impact GDP trajectories in the short term, it is the continuous generation of ideas and R&D that will help fuel long-term GDP growth. In this regard, a new working paper at the National Bureau of Economic Research (NBER) – a leading economic research organisation based in the US – shows a worrying trend: Sliding research productivity across all major industries in the US despite exponential increases in research effort. What does this mean? More and more research is being required to maintain the same level of economic growth. 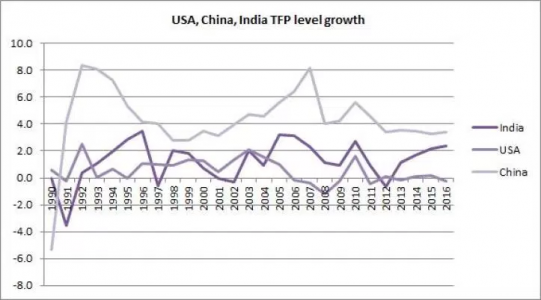 India, on the other hand, has been recently on a path of rising total factor productivity growth (TFP). This makes it extremely important for India to step up its R&D spending and improve its R&D infrastructure in order to provide a sustainable path to a long-run economic growth trajectory. For economists, Jefferson perhaps characterises the most important feature that an idea possesses: its non-rivalrous nature. In public economics, a good is said to be non-rivalrous if one person’s usage of the good does not diminish simultaneous usage by other users. For example – consider the information contained in the blueprint of an iPhone. Once the display, processor type, recognition system along with a host of other specifications are finalised upon, that blueprint is replicated across all the Apple factories. Replication of the blueprint in an Apple factory in Shenzhen, China does not prevent its counterpart in Bengaluru, India from using it. The idea embodied in the blueprint is thus non-rivalrous. The property of non-rivalrousness ensures increasing returns to scale for an economy’s production function. It is this non-rivalrousness nature that places ideas at the centre of the theory of economic growth. Amongst many other things, the invention in medicines, telecommunications, space science, digital space all represent ideas that have been, in part, responsible for economic growth over the last two centuries. Quantitatively, US per capita income today is nearly 17 times to that of 1870 levels. During 1870-2017, US GDP per capita has grown at a healthy average rate of nearly 2% per year. Moreover, this income growth has brought about an even higher transformation in living standards of people as reflected by the quality of life indicators vis-a-vis levels two centuries before. The role of ideas in economic growth has long been a problem which economists have been intrigued with. It was in the 80’s and 90’s, however, that the literature on ideas and economic growth gained traction with a series of writings by Paul Romer, the current chief economist at the World Bank. In a series of papers, he argued on how public R&D spending and subsidies could positively influence the long-run rate of economic growth. Two results of his work are central to our understanding. Firstly, the rate of economic growth is determined by the stock of human capital and knowledge the economy possesses. Secondly, public R&D is crucial to the development of ideas as private markets generate too little R&D in market equilibrium owing to their non-rivalrous nature. To sum it up, public provision of R&D is a crucial positive determinant of the rate of economic growth. To account for ideas and technological progress in growth models, economists are usually interested in the TFP. TFP accounts for the growth in output not accounted for by the growth in inputs used for its production and is often synonymous with improvements in the technological state of an economy, and is an important concept in economic growth accounting. However, in his 1995 treatise ‘R&D Based Models of Economic Growth’, Charles I. Jones of Stanford University argued against the then prevailing theories predicting ‘scale effects’ of R&D spending. The ‘scale effects’ literature argues for a proportional relationship between the quantum of resources devoted to R&D and its effect on per capita output growth. For example, if the number of engineers, researchers and scientists engaged in R&D is doubled, the per capita growth rate of output should also double. However, Jones’ empirical analysis showed how scientists engaged in the US R&D industry had increased from the 1950s to 1990s, but the TFP growth had remained largely constant and seemed to be uncorrelated. Not only in absolute numbers, even the share of labour engaged in R&D had tripled over the same time period despite a nearly constant TFP growth. Building on Jones’s 1995 work, a new working paper at the NBER looks into the productivity of research effort, that is, how research effort correlates with an increase in output. 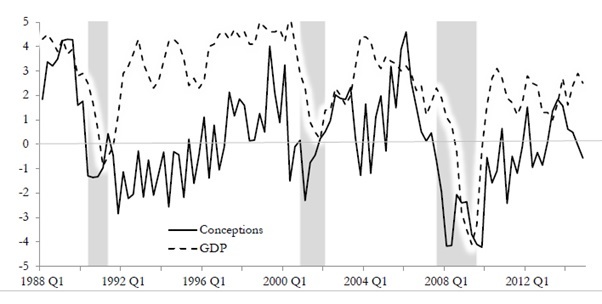 ‘Are Ideas Getting Harder to Find‘, authored by Nicholas Bloom and Michael Webb of Stanford University, John Van Reenen of Massachusetts Institute of Technology and Jones himself, tries to empirically calculate research productivity in the US both at the micro (industry) level and the aggregate US economy as a whole. The key implication, therefore, is that it takes more research effort today to produce the same level of output growth as it did yesterday. The quartet finds that the aggregate research productivity for the US falls at an average rate of 5.3% every year, implying a doubling of research efforts every 13 years in order to maintain the same level of economic growth. These findings indicate that the US and other major economies of the world today would need to sustain their economic growth levels with even higher levels of research effort. Now, these claims may dampen the spirits of even those who are most optimistic about growth prospects of these countries. But it is important to put some context into the authors’ findings. Figure 2. This shows aggregate data on growth and research effort.The idea output measure is Total Factor Productivity (TFP) growth. 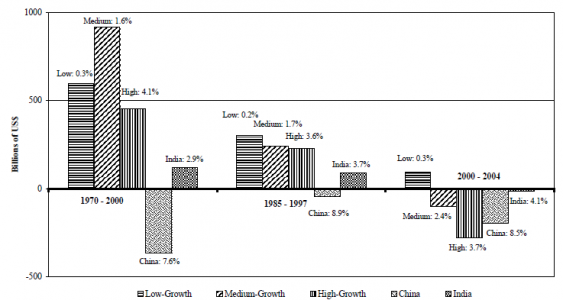 During the period 1930-2000, TFP growth has been relatively stable or even declining. The effective number of researchers has increased by a factor of more than 23. Source: Bloom, Jones et.al (2017). First, US real GDP was a little over $2 trillion in 1950, from which it has grown to over $17 trillion today. As a result, the same magnitude of economic growth today implies a much larger increase in income in absolute terms. Therefore, the fact that higher research effort is required to maintain the same level of economic growth can be explained by the large base the US economy possesses. In this sense, the paper just reaffirms our understanding that as an economy grows, an increasing amount of investments in R&D is needed to push the economy forward. Second, what the authors measure here is not technically the difficulty of getting new ideas but rather the onerous task of developing them further as they mature. Third, the TFP measure is also a reflection of our measure of ignorance. This ignorance covers many components, some wanted (new technical innovations, higher R&D output), others unwanted (measurement errors, model misspecification). Therefore, to rely on TFP growth as a sole indicator of technological progress may very well be misleading. Fourth, continuous innovations in technology, artificial intelligence, biotechnology etc may not have shown up on TFP yet but arguably have the potential to put an economy on an upward growth trajectory in the future. Present accounting standards for TFP may very well fall short in capturing the forward-looking dimension of R&D. Therefore, unqualified conclusions from this paper are certainly not recommended. On the domestic front, India’s public spending on research has been stagnant at around 0.8% of GDP for over a decade. As a major growing economy, we have been happy to piggyback on the innovations of the advanced economies and use them in an Indian setting, despite some exceptions. However, if the authors’ findings are true, then the advanced economies are definitely facing a problem of declining returns to research. As a result, it is important for India to seize the initiative and start investing in R&D, and develop a robust R&D infrastructure if it wishes to maintain a sustainable and a high economic growth path. While the jury is still out on whether it was demonetisation or the introduction of GST that reflected in the dismal Q1 growth percentage of 5.7 %, it is important that we should not stray away from investing in R&D that will ultimately lead us to a higher long-run growth trajectory. The Modi government’s flagship schemes such as Impacting Research Innovation and Technology and Uchhatar Avishkar Yojana are pivotal to India’s R&D growth story. The non-takeoff of the Vishwajeet scheme is certainly a setback to the research centres and universities that were seeking financial resources for research. It is essential that India respects these words more generously.